I grew up eating avocadoes. My grandfather was an orange rancher in Orange County back when there still were oranges in the OC. The orange juice from his trees is still the best I’ve ever tasted, but it was the few avocado trees he had in his orchard that I think of more often. Snacks at my grandparents’ house regularly consisted of mashed avocadoes spread across saltines with a few sprinkles over the top. Unlike mine, my grandma’s style was not at all spicy, but that’s the avocado taste I’ve always loved—in salads, sandwiches, and in soup. It’s mild and rich and has a buttery melt-in-your mouth texture without excessive oiliness. It’s also the basis for this week’s recipe: Guacamole Soup. As you’d expect from my pro-avocado leanings, I prefer my guacamole mild so the avocado shines through. That means using a mild salsa and sometimes forgoing the lime. If you’d prefer it spicier, that’s your decision, but you’ll have to face final judgment on your own. FYI: Shakespeare was actually talking about avocadoes when he gave that line to Lear. Although avocadoes had yet not made it to England by that time. Their absence was enough to drive the old king around the bend. It could do the same to any of us. The soup starts with avocadoes, ripe avocadoes, which are always a joy to work with. I should know. I’ve been separating avocado meat from its skin almost as long as I’ve been allowed to hold a knife. The process is simple, as I detail below for the uninitiated. The first step is to slice the avocado (sometimes called an alligator pear for the color and texture of its skin) in half. You do this by cutting through the flesh to the pit, but not into the pit. Then you turn the fruit (technically a large berry) in your hand and extend the cut all the way around to where you started. Next you twist the two halves in opposite directions and, if it’s ripe, the sections will easily pull apart leaving the whole pit in one half and an egg-shaped hole in the other. After that you hold the half with the pit in one hand and slap the edge of your knife into the pit hard enough so it sticks. (Careful!) Then you turn the knife like a lever along the flat edge of the fruit and the pit twists right out. If you’ve got a little salt and a spoon, you could call it quits right here and eat it right out of the shell. 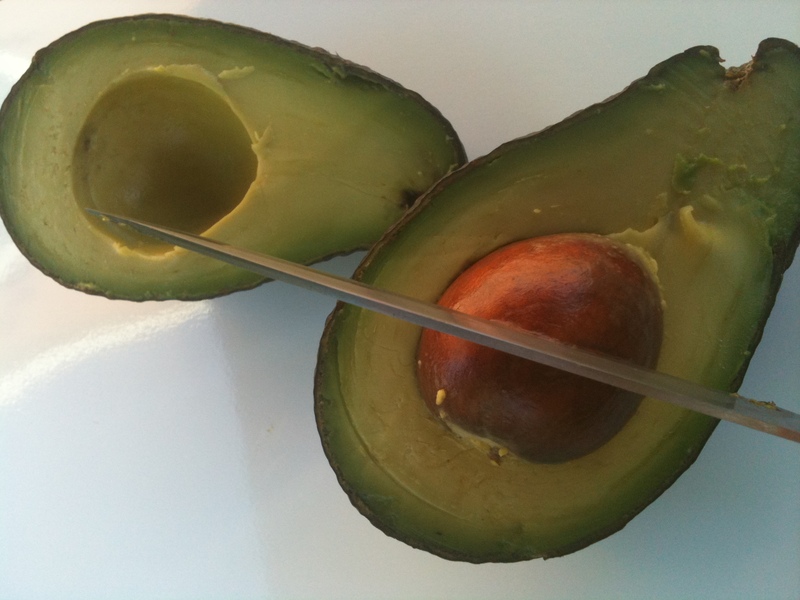 You can also use the spoon to scoop the avocado out of the peel, in chunks or as one big piece. To make the soup, you take the eight peeled & pitted avocadoes and combine them with the onion, salsa (very mild, please, you won’t regret it), vegetable and tomato stocks and puree it all together. You don’t even have to simmer it if you don’t want to. I did, but the heart of this soup is fresh, so I didn’t overdo it. Then you serve it at room temperature garnished with crushed tortilla chips. In retrospect, maybe I should have garnished this soup with crushed saltines. That’s what my grandma would have done. 2 ½ cups tomato salsa, mild. Mild, mild, mild! Peel and seed the avocadoes then add them to the pot with the onions, salsa and stock. At this point I brought the mixture to a boil and let it simmer for 10-15 minutes, but you can skip this step if you want a fresher tasting soup. Finely chop the cilantro and stir it into the soup along with the seasoning. Serve with crushed tortilla chips sprinkled on top and you’re ready to go. Image Credit: An avocado, this one’s a Hass, which is about all you can find anymore. The one’s I grew up with were Fuertes. Did you know that the French word for avocado is the same as the word for lawyer? Please don’t make the mistake of using lawyers in this recipe. Although, if it turns out well, I’d love to hear a comment about it. Regardless, I’ll be reading and responding.